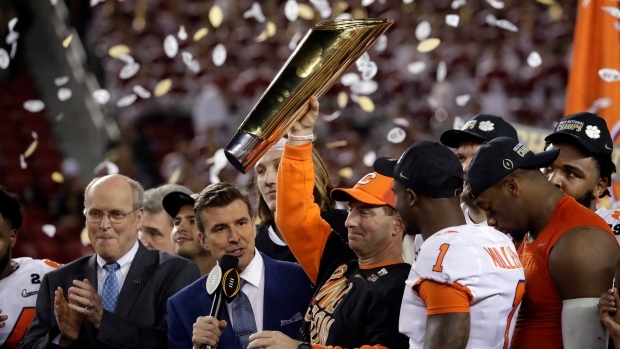 SANTA CLARA, Calif. — With stunning ease — and a freshman quarterback — Clemson toppled college football's greatest dynasty again to become the first perfect playoff champion. Alabama's Tua Tagovailoa threw two crucial interceptions in the first half, the first returned 44 yards for a touchdown by A.J. Terrell to put Clemson up 7-0. The Tide came in scoring 48 points per game, but was shut out over the final 44 minutes by an opportunistic Clemson defence that stiffened in key spots.